RJE Business Interiors: Meet the Generation Family! This is the first family of chairs that lets you sit how you want. Recognizing that we fidget – from tapping our feet to twirling our pens – to keep us alert and engaged, Formway Design gave MultiGeneration form and function that encourage natural movement, allowing us to focus, interact and communicate more effectively. The Knoll Generation Chair is designed around the idea that there is no single right way to sit. 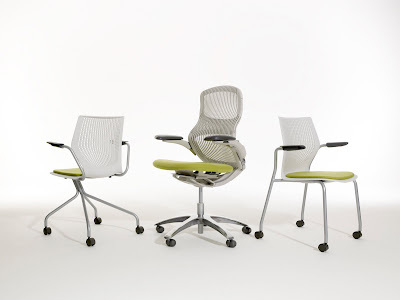 The typical task chair is made for sitting in an upright, forward-facing posture, which is only one of many ways workers use their chairs in the increasingly dynamic modern workplace. With this in mind, the Generation moves as users move. Would you like to experience the movement? RJE Business Interiors in Indianapolis has several of the Generation task chairs and MultiGeneration chairs in their showroom. Just give us a call or stop by our showroom at 621 East Ohio Street, Indianapolis, IN 46202.